Clinical teachers are not trained in how to handle bias and discrimination in the clinical setting where they are teaching. When bias occurs, they don't feel comfortable addressing it. Students have complained that these issues are not being addressed appropriately, and that it negatively impacts the learning environment. 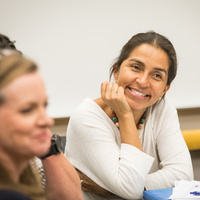 As part of the UCSF School of Medicine Differences Matter initiative, the goal of Diversity, Equity, and Inclusion Champion training is to increase awareness and skills for clinical teachers so that they can address bias and discrimination when and where it happens. Breakfast, lunch and afternoon stack will be included so please register only if your schedule allows. No technology or devices are needed for this training. UCSF designates this live activity for a maximum of 276 AMA PRA Category 1 Credits™. Physicians should claim only the credit commensurate with the extent of their participation in the activity. The above credit is inclusive of all UCSF Educational Skills Workshops and the Teaching Scholars Program. Credit available for this event only is 7 AMA PRA Category 1 Credits™. Important! Please make sure your schedule is free before registering.